What is life like when you first get to the UK as an asylum seeker? Whilst Syrian refugees continue to flee from their country in search of sanctuary and a better life, there’s still little sign of consensus in Europe in terms of a unified policy of aid and support, although the debate has at least become more compassionate in recent weeks. Continuing to focus on the personal, today’s interview is an excerpt from a piece first published in full in Critical and Radical Social Work in which campaigner Amal Azzudin talks about her experience of coming to the UK and the ongoing fight against racism. Original interview by Laura Penketh, Liverpool Hope University, UK. The policy of detaining children for immigration purposes ended in 2010. The ‘Glasgow Girls’ campaign played an important part in the decision to change the law, and also contributed to the implementation of a more child-friendly asylum process. These were a group of smart and feisty teenage girls and school friends, who took on the might of the system when, in 2005, their friend Agnesa Murselaj, aged 15, and a pupil with them at Drumchapel High School in Glasgow, was dawn-raided and detained with her family. What follows is an interview with one of the ‘Glasgow Girls’ – Amal Azzudin – who campaigned alongside her friends, Roza Salih, Ewelina Siwak, Toni-Lee Hendeson, Jennifer McCann and Emma Clifford, to fight for the release of their friend Agnesa. Can you tell me a little about when you arrived in Glasgow, where you came from, and your first impressions of the city? I came to Britain from Somalia and we left the country due to the civil war that is still ongoing. There are tribes who fight amongst each other, which caused, and still causes, much unrest and danger to civilians. My mum and I left because it was getting too dangerous for us. My mum, my baby sister and I initially lived in London for 18 months but we were living in crowded accommodation and then found out we were going to be dispersed. We thought that meant to somewhere in the local area but we were dispersed to Glasgow. We were on a really big coach with loads of other families and they were all gradually dropped off. I asked the coach driver if we were going to be the last ones being dropped off and he told us yes, because we were going to Scotland. We had never heard of Scotland or Glasgow. When we found out, one of the women on the coach said she felt sorry for us going to Glasgow as “everyone is racist and it snows all the time”. But they were so wrong and it is my home now as I have lived here most of my life. What were your early experiences of life in Glasgow around issues of ‘race’ and racism? At the beginning there was a lot of racism and the biggest mistake the council made was not to prepare local people for asylum seekers. The community was not prepared for our arrival and there was a lot of ignorance around. One of my friends from Algeria got stabbed and nearly died trying to stop a fight. There was a large police presence outside the school at the time and it was very scary. I got my headscarf pulled off by boys and stuff like that. It got so frightening that my mum said that we should not leave the house after 6pm. We stayed in the high rises, which was really bad and it was not safe for us to go out in the evening. I think my mum experienced more problems as I had Drumchapel High School and my teacher Mr Girvan, which made it much easier for me. My mum had little support and she found it difficult finding her way around the area. Her English was not good initially but she went to college and took some courses and then we got granted leave to remain. Now she is a community worker and is very well known and she works with asylum-seeking women around female genital mutilation. She is part of society now and is very busy work-wise. Can you tell me how the ‘Glasgow Girls’ campaign began? In 2005, one of my friends from Kosova, Agnesa, was arrested and detained and our campaign started when we fought to get her back. I was the first to go to our teacher, Mr Girvan, when we found out she had been taken away. I said I was not going to attend classes because I did not understand why she had been removed and was being treated like a criminal. She had done nothing wrong and had been living in Glasgow for five years. Obviously they couldn’t force me to go to classes and the other girls joined me because we were all very upset and distressed. Roza and Ewelina were in the same situation as Agnesa and did not have leave to remain so they were very scared they might be next. For me it was horrible knowing I had the right to remain, and it was also a worrying time for my mum. She did not want me to threaten our situation and wanted me to keep out of it. But Agnesa was just a child like me and I had to do something – my conscience would not let me leave it. I did not know if I was going to achieve anything but I knew I had to try. How did the campaign progress and what strategies did you adopt? Mr Girvan asked us what we wanted to do, so Emma came up with the idea of a petition. We went round the whole school and got people to sign a petition to get Agnesa back and I think that was the first step in combating racism in the school too. Other pupils were like “well, we don’t like you and we don’t know why you are here but Agnesa is one of us now”. This gave us the chance to talk and explain why we were in Glasgow and once people heard our stories it made a huge difference. Obviously we knew we couldn’t change everyone’s mind and there were some pupils who did not want to understand, no matter what, but we did start to change things. It was really important that the school supported us. The head teacher and most of the other teachers were great. Anyway, almost everyone at school signed our petition and we took it to our local Member of the Scottish Parliament and he invited us to Parliament to sit in on debates. We were also invited to meet the First Minister at that time and it just took off from there. We were on news programmes regularly and Agnesa was released three weeks later. What was the significance of your actions in terms of changes to attitudes? I always say that the biggest thing we achieved to this day is raising awareness. I think what was really successful about the campaign was that we were a group of seven girls who were not politicians. We had no agenda and we were children. That was very powerful. There is a common stereotype that young people cannot be involved in politics and stick up for their rights and we broke those myths. People saw how passionate and determined we were. I was increasingly recognised and was always being photographed, and I did not fit the common stereotype of a Muslim woman because I was opinionated and outspoken. I felt I needed to take advantage of my growing status to influence change. In Somalia I would have been oppressed and silenced very quickly if I spoke out and I could even have been killed. It was as extreme as that. Looking back, we have come a long way. Of course, there is still a lot of racism out there, but I think there is also more understanding too. Are conditions today any better for asylum seekers seeking leave to remain? Well, families cannot be placed in detention centres now in Scotland. This is not supposed to happen across the UK but I know that in England this is not the case. There are not as many dawn raids now either, but what happens is when people go to sign on at the Home Office they just keep them and deport them. One woman I know has been seeking asylum for 20 years. She came here when she was 13 and she is now 33. She cannot go to university despite being really clever and although she has so much to contribute to society and the economy, she can’t. She has to sign on each month and she is absolutely terrified the night before. Sometimes I go with her and wait outside and she can be in there for an hour or more. We are the only country in Europe that has indefinite detention. What are your thoughts on rising levels of Islamophobia in society? It is an extremely tough time for Muslims in the West at the moment due to the rise in Islamophobia. I have heard and read so many stories about how Muslim men and women have been verbally abused and physically attacked. The horrific acts committed by a few people who ‘claim’ to be Muslims are being used to ‘tar everyone with the same brush’. According to the 2011 Census, Islam has been practised in the UK for 300 years yet somehow it is now that we see the rise of anti-Islamic views and attacks on Muslims. Islamophobia is being used by certain groups such as the far right to divide communities and incite hatred. The media has a huge role to play in promoting the rise of anti-Muslim hatred. The continuous double standards of some sections of the media only feed into the rise of segregating Muslim communities from the rest of society. There is an issue regarding some people’s lack of understanding regarding what Islamophobia is and that it a worry because if people do not recognise it then how can we challenge it? Muslim women may be an easy target for Islamophobic attacks, especially if they are wearing the headscarf and are visibly recognised as a Muslim. There was an old man who was murdered when he was going home from his local mosque and a pregnant woman was attacked because she was wearing a headscarf. These sorts of attacks spread fear among communities and should not happen to anyone, regardless of race, religion and gender and so on. What are your hopes and expectations for the future? Well, my name Amal means ‘hope’ in Arabic so I am always hopeful and I try to stay positive. We are facing very difficult times and the issues that we have to confront are huge. I think future debates are going to be interesting. I am so proud of the city of Glasgow and how people stand up against injustice, which is not the case everywhere. Despite many challenges, when I look at the UK as a whole and compare it with France, I think we are in a much better position. For example, we have not banned the hijab here and I hope we never do. I think we have to educate and communicate with people from all backgrounds and break down barriers. Schools could be very important in educating young people and raising awareness, and I think leadership in schools is crucial. There could be input from primary school onwards. We have been invited into schools to talk about our campaign, which has been very successful. A couple of weeks ago, we spoke to Primary Seven pupils in a local school who wanted to start their own campaign for the right for every child to have an education. There was an assembly, which we were invited to attend along with parents, and the children had made placards and put together a petition, which they were getting people to sign. The local newspaper did a big piece about it and their teacher said they were going to come to the city centre to hold a mini-demonstration. In school they had pictures of Nelson Mandela and Malala Yousafzai on the walls and one of the pupils went home and wrote about me. It was overwhelming. Imagine if all schools promoted active citizenship in this way! 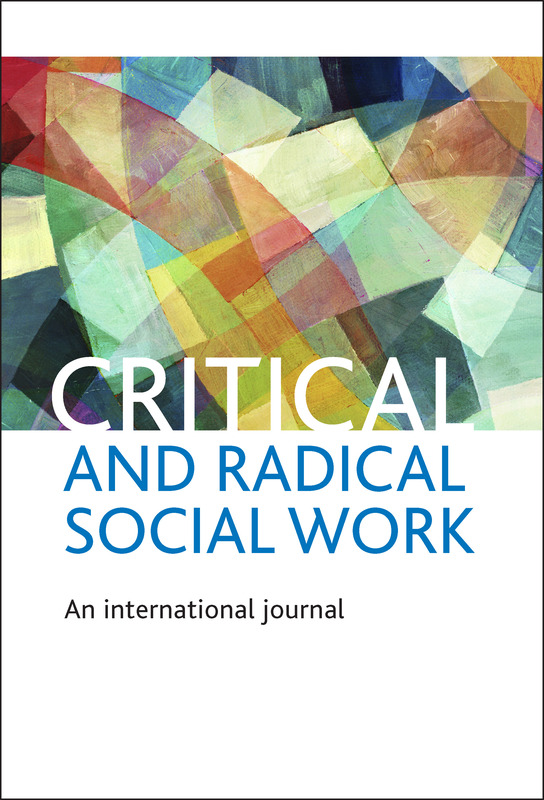 Interview reproduced courtesty of Critical and Radical Social Work. For more information about the journal and to find out how to subscribe please click here. To read the interview ‘Asylum, immigration and anti-racism – an interview with Amal Azzudin’ in full please click here.